A cross between a moon buggy and a radiocontrolled cross-country car. Or at least that’s how it looked to most visitors to the item Industrietechnik GmbH stand at the Motek trade fair. In actual fact, the device on show was the VolksBot Lab robot of the Fraunhofer Institute for Intelligent Analysis and Information Systems (IAIS). 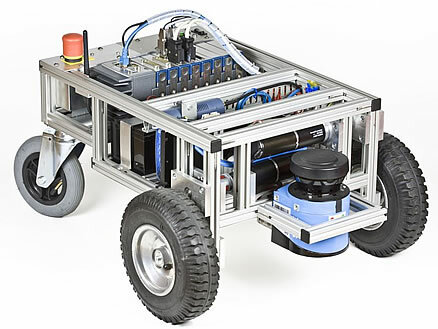 The potential applications for this modular building kit system for mobile robots stretch from research and teaching in universities to industrial use as a basic platform for prototype autonomous transport and exploration vehicles. One such robot based on the VolksBot system is MarBot, developed with the Alfred Wegener Institute for Polar and Marine Research. MarBot is a six-wheeled robot designed to take sea bed samples in shallow water. The 2009 RoboCup World Champion in the RoboCup@Home league, Johnny the Robot from Bonn-Rhine-Sieg University in Germany, is also a VolksBot variant. Numerous VolksBot variants have been developed to meet the differing demands of indoor and outdoor applications. Thanks to the VolksBot building kit system, a broad spectrum of robots can be constructed for specific applications at low cost. The lightweight aluminium supports of the robot chassis deliver the high rigidity that is essential for robust robots. And it is precisely because of these special requirements that the entire chassis is made using aluminium profiles from Line 5 of the item MB Building Kit System, which offers exceptional flexibility.